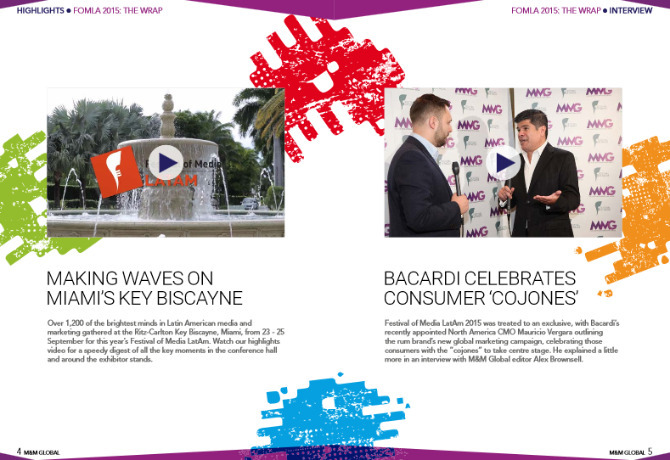 Missed Festival of Media LatAm 2015? Wondering what global influencers, brands and agencies have to say about media in Latin America? Then you need to read M&M Global’s comprehensive ‘Wrap Report’ from the event. FOMLA, which took place on 23-25 September, attracted nearly a thousand media exhibitors, and conference speakers such as Instagram’s Daniel Habashi, The Hollywood Reporter’s Michael Wolff and Latina Magazine’s Christy Haubegger . In our 30-page report, we provide a comprehensive overview of the main topics for debate in the conference halls, and offer a flavour of what it felt like to be at the Ritz-Carlton Key Biscayne in Miami. We also have an exclusive interview with Bacardi North America CMO Mauricio Vergara outlining the rum brand’s new global marketing campaign – as well highlights from our video interview studio.